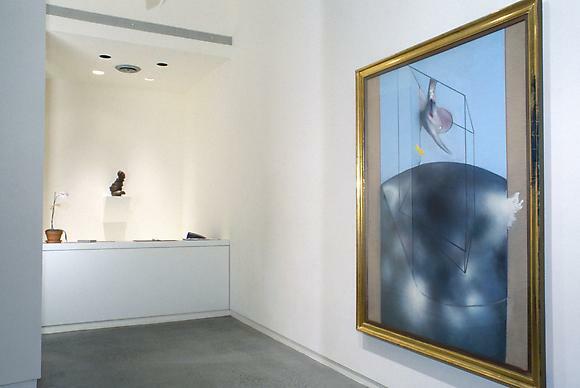 Cheim & Read Gallery, with the collaboration of Jean Clair, the Director of the Musée Picasso, is pleased to announce a loan exhibition of the work of Francis Bacon, Louise Bourgeois and Franz Xaver Messerschmidt which runs from November 18th through December 31st, 1998. In dealing with the body, each artists explores the intersection of extreme emotions with physiology, science and psychology to faithfully depict the human condition. Franz Xaver Messerschmidt (1736-1783) was a Baroque Viennese sculptor who, in an effort to rid himself of spirits that haunted him, created a series of sixty-four self portraits depicting different facial expressions. Rediscovered in the 1930s by the Viennese school of psychology, Ernst Kris wrote a paper analyzing Messerschmidt's life and work and proposed that they were an expression of the artist's schizophrenic state. While other historians have debated this interpretation, Messerschmidt's mysterious body of work has a strong contemporary sensibility. These loans come from the Museum of Fine Arts, Budapest; the Slovak National Museum, Bratislava; and the Osterreichische Galerie in Belvedere. Francis Bacon (b. 1909 Dublin, d. 1992 Madrid) who spent a life focused on the depiction of the human body will be represented here by three paintings: the first an important picture never before seen in America, Untitled 1943 (a variant of the right-hand panel of the triptych Three Studies for Figures at the Base of a Crucifixion in the Tate Gallery), as well as Man on a Chaise Loungue, 1954 and Oedipus and the Sphinx after Ingres 1983. Louise Bourgeois (b. Paris 1911) moved to New York after 1938. Since the early 1940s, she has been making art that deals with giving form to memory and the subconscious life. She is represented here by a suspended latex piece Fillette 1968 from the Museum of Modern Art, a 1995 work from the Cell Series Cell (Hands & Mirrors), as well as Couple I 1998, a hanging fabric piece first shown at the Musée d'art Contemporain de Bordeaux. A 48 page catalogue with 21 illustrations and a text by Jean Clair is published on the occasion of the exhibition.